Immediately upon arriving at the command post of Colonel Shoup, Colonel Edson began to make plans for the next day's attack. The two colonels first took up the problem of naval gunfire support and air support. They requested naval gunfire to work over the eastern end of Betio, starting on a line across the island east of the turning circle at the east end of the main air strip and including the rest of the eastern part of Betio. The heavier fires, i.e., the 14- and 16-inch shells, were to be placed only on the eastern one-third of the island, 500 yards from the nearest friendly troops. The air support was to bomb and strafe the same general areas assigned to naval gunfire. At 0700, the ships and planes were to bombard the assigned target areas for a period of 20 minutes. Then at 0830, the same fires on the same areas were to be repeated for another 20-minute period; this was to be followed by another 20-minute bombardment at 0930 and another at 1030. Next, Edson turned to the reserve landing team waiting near the control vessel at the line of departure. McLeod had boated his team, the 3d Battalion, 6th Marines, at 1600 on the day before and was still waiting near the control vessel at the line of departure. Shoup's command post was in radio communication with division, but neither division nor Shoup were in contact with either McLeod or Jones. To reach either landing team, it was necessary first to contact the 6th Marines and have the message relayed. Edson set to work to have Jones come up on the command net of the 2d Division. Until such time that more troops of the 6th Marines were landed, it seemed best for the 1st Battalion, 6th Marines, to be controlled by Shoup. It was well after dawn before communication between Shoup and Jones was established. Acting on Edson's recommendation, division sent a message to McLeod at 0319, ordering him to land on GREEN Beach North at 0800 on the morning of 22 November and to be prepared to attack on order from division. Relative to this, Edson sent a message to division at 0359 to have the 3d Battalion, 6th Marines, rendezvous off GREEN Beach South at 0800 and to wait for further orders to land. Finally, division sent a message to the 3d Battalion, 6th Marines, at 0641, directing McLeod to wait off GREEN Beach next morning prepared to land on either half of the beach when so ordered by Colonel Shoup. After consultation with Colonel Shoup, Edson issued verbal orders at 0400 to Shoup and Col. Elmer E. Hall regarding the attack to take place at daylight on the morning of 22 November, the third day of the battle. To make sure that Maj. W.K. Jones, commanding the 1st Battalion, 6th Marines, received his orders, Colonel Edson directed Maj. R. McC. Tompkins, an assistant to Colonel Rixey, the operations officer of the division, personally to carry the message to jones over on GREEN Beach. At the time that Edson issued his attack orders he was not in communication with Jones. LOOKING EAST ON SOUTH SHORE along the airfield where the attack of the 1st Battalion, 6th Marines began. with the 8th Marines (less his 1st Battalion, which was attached to the 2d Marines), was to continue his attack to the east. Besides the air and naval gunfire support ordered for the morning of 22 November, the division prepared to augment the fires of its artillery ashore on Betio by placing two batteries over on Bairiki. As soon as the report from Murray, of the 2d Battalion, 6th Marines, was received that his landing on Bairiki had been made against no opposition, division instructed Colonel Holmes of the 6th Marines to send the 2d Battalion, 10th Marines, less Battery D, ashore on Bairiki the first thing next morning. 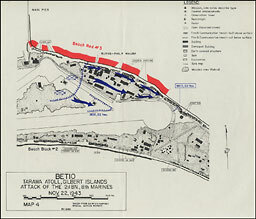 Holmes then notified the 2d Battalion, 10th Marines, to boat up at 0330, 22 November and to land on Beach BLUE 2.
on the tail of Betio, adding its firepower to that of the 1st Battalion, 10th Marines. The transports returned to their unloading area at 0700 and it was not until noon that Battery F and the rest of H & S Battery reached Bairiki. Battery D, originally ordered to land on GREEN Beach on Betio, found that the hydrographic conditions off that beach were not favorable to landing artillery and was then ordered to go to Bairiki instead, there to rejoin its parent organization. At 0700 in the morning of the third day on Betio, the 1st Battalion, 8th Marines, attacked to the west in an attempt to clear the strong Japanese positions on the boundary between Beaches RED 1 and RED 2. On the right of the battalion front and next to the north shore was Company B. 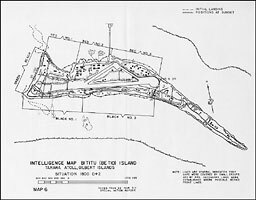 In the center of the line was Company A, and over on the left Company C reached over to the enemy revetments along the north side of the west end of the airfield. During the morning the attack was supported by three light tanks from Company C, 2d Tank Battalion. The tanks, covered by infantry, moved up to several pillboxes which were halting the advance of the 1st Battalion, 8th Marines, and maneuvered so that the muzzles of their 37-mm. guns were almost pointing directly into the openings of the pillboxes before firing. The construction of the pillboxes and the manner in which they were reinforced made it impossible for the 37-mm. guns to do much damage. Strong points of resistance were ultimately reduced by a combination of bangalore torpedoes and shape charges placed under most hazardous conditions. One tank was put out of action during the morning by what was believed to be a magnetic mine. At 1130 the tanks were ordered to report back to the command post of the 2d Marines and a section of 75-mm. self-propelled guns from Weapons Company, 2d Marines, under Maj. Frederic R. Smith, were sent up in their place. One of these half-tracks immediately received small arms fire which damaged its radiator, forcing it to retire. 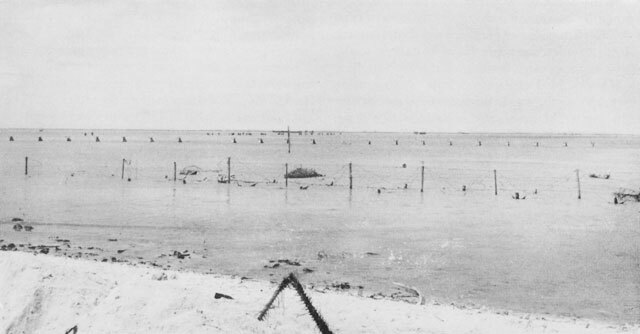 During the afternoon Companies A and C of the 1st Battalion, 8th Marines, made good progress, but Company B, over against the beach, was held by intense enemy fire from its front. Although little ground was gained, as far as area is concerned, several strong points of resistance were destroyed by Hays' landing team during the day. At least, the Japanese core of resistance in the Red 1-RED 2 region was contained. Late in the afternoon the enemy in this compact area tried one small counterattack against the 1st Battalion, 8th Marines, but gained no success. As late as 0505, 22 November, Colonel Edson had no contact with Maj. W.K. Jones of the 1st Battalion, 6th Marines. An hour had elapsed since Edson had issued his attack orders and he was anxious for Jones to learn of his mission in plenty of time to make the necessary preparations. At that time, Edson sent a message to division asking that Jones be notified of the plan. It was learned a little later that the 6th Marines was not in contact with its 1st Battalion. However, on the way over from the command post of Colonel Shoup, Major Tompkins was slowly making his way to Jones' position. Finally at 0653 Edson received a message at Shoup's headquarters that division was in communication with Jones. Then at 0735, Tompkins got a message through to Edson and Shoup, telling them that he had contacted Jones and had acquainted him with the operation plan for the attack. After a delay necessitated by refueling tanks, Shoup ordered Jones to attack at 0800 with the mission of clearing the south side of the island as he attacked east until he reached the 1st Battalion, 2d Marines. When the troops of the 1st and 2d Battalions, 2d Marines, were reached, Jones was to pass on through them, prepared to continue the attack on order. With three tanks from the 3d Platoon of Company B, 2d Tank Battalion in the lead, Jones attacked at 0815. The zone of action assigned the 1st Battalion, 6th Marines, was little more than a hundred yards wide and Jones attacked on a one-platoon front with Company C in the assault. The three tanks, out about fifty yards in front of the infantry, were instructed to destroy any enemy strongpoints that might be encountered. The troops behind the tanks were always close enough to give protection against enemy personnel bent on the suicidal mission of placing a magnetic mine against a tank. Resistance was light initially and Jones reached the 1st Battalion, 2d Marines, at 1100. During the attack along the south coast, Jones' men had killed about two hundred and fifty of the enemy at the expense of only light casualties to themselves. 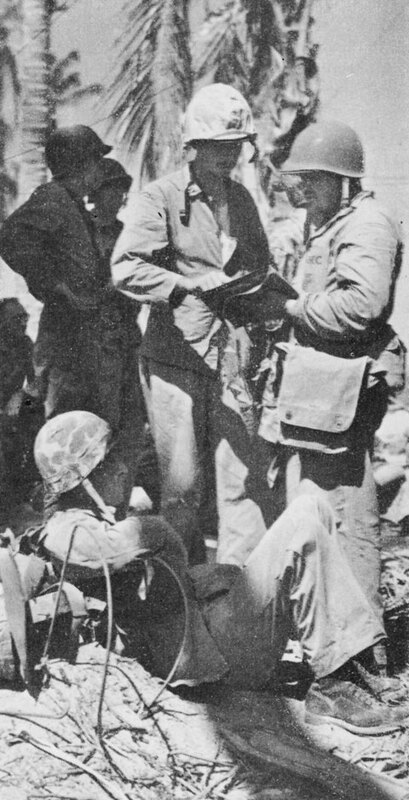 CoL. DAVID M. SHOUP (map case on hip) confers at his command post with one of his officers during the battle. Helmeted figure with hands on hips (second to left of Shoup) is Col. Merritt A. Edson. Just before the 1st Battalion, 2d Marines was reached, Jones received orders to report to Colonel Shoup at Shoup's command post. From Shoup, Jones then received instructions to continue the attack to the east at 1300. With the exception of the pocket of resistance that still held out on the boundary between RED 1 and RED 2, the western half of Betio was now held by the 2d Marine Division. That pocket was being reduced by Hays from the east while Ryan held on the west; it no longer constituted a serious threat to the capture of the island. 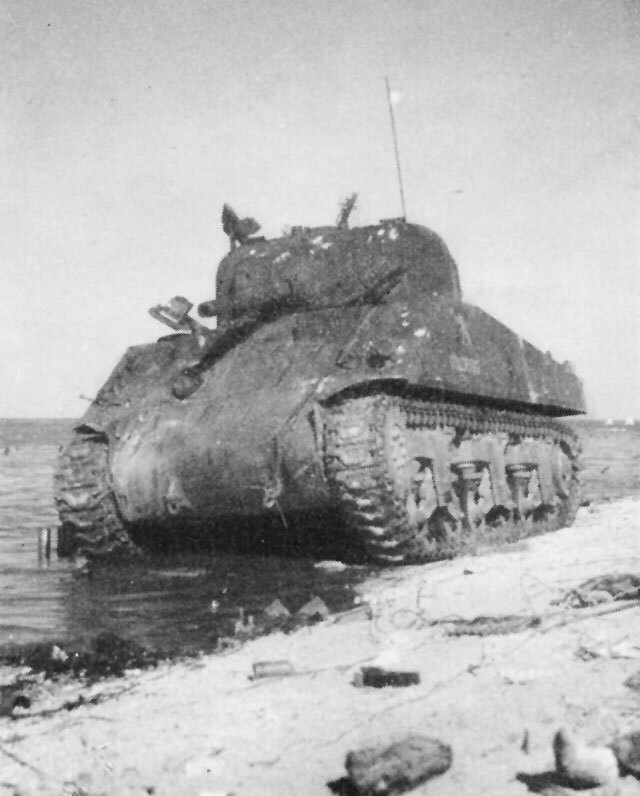 For his attack in the afternoon, Jones was to be provided with all available tanks, naval gunfire on the eastern part of Betio, and support from the two battalions of artillery on Betio and Bairiki. At the same time, the 8th Marines, less Hays' landing teams, would attack to the east in conjunction with Jones' attack. Colonel Hall had pointed out that the condition of his troops was such that he felt that they could make probably one more attack and after that would have to be relieved. The 2d Battalion, 8th Marines, with elements of the 3d Battalion attached, had worked for 2 days on the strong Japanese positions northeast of the east taxiway and the resistance had been so heavy as to deny much in the way of progress. Edson told Hall that as soon as the 8th Marines finished cleaning up the strong Japanese pocket near the east end of the airfield, the attack of the 1st Battalion, 6th Marines, with the fresh troops of the 3d Battalion, 6th Marines, close behind, would make it possible for the 8th Marines to get some rest. Early in the morning of the third day, Maj. "Jim" Crowe reorganized his troops in preparation for the day's attack. Three strong points of enemy resistance had to be reduced before the attack could make much progress. One was a steel pillbox to the left front, near the Burns-Philp pier. This pillbox was in Company F's zone of action. 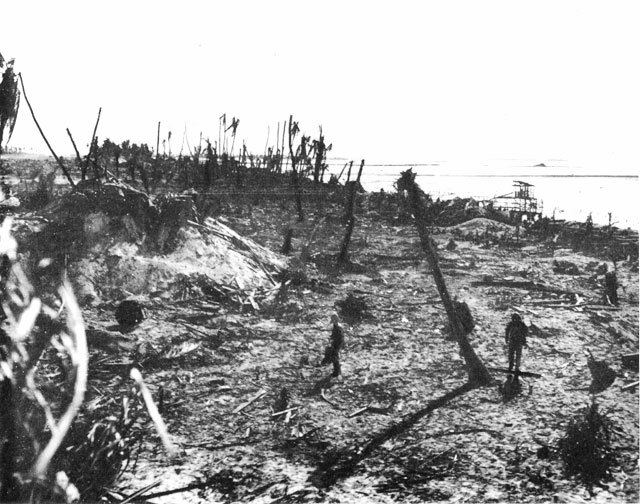 To the front of Company K (a 3d Battalion, 8th Marines Company, but operating under the direction of Maj. W.C. Chamberlin, Crowe's executive officer), was a coconut log emplacement; from it the Japanese kept machine-gun fire aimed on Company K, and most of the time had the company pretty well pinned down. The third enemy position that had to be reduced was a large bombproof shelter, inland to the south from the steel pillbox. These three enemy positions were mutually supporting. One could not be reduced without the assaulting troops coming under the fire from the other two. The attack on this day was to be a battalion attack, starting with Company F on the left. As Company F assaulted the steel pillbox, the next company in line was to move forward, and thus the advance would be taken up across the entire front of the 2d Battalion, 8th Marines. At 0930 the mortars supporting Company K, which was on the right of Company F, got a direct hit on the top of the coconut log emplacement to the front of the company. The mortar round that hit the emplacement caused an ammunition dump to explode and this completely destroyed the enemy position. In the meantime, a medium tank maneuvered into position west of the steel pillbox and got several direct hits on that pillbox. This enabled Company F to begin to move to the east. Now the large bombproof remained to be taken and the next attack was launched in its direction. Attached to the battalions were assault engineers from the 18th Marines. These men had the flamethrowers and demolitions. Under the covering fire of riflemen, the engineers worked their way up to the bombproof and after a hot fight that lasted for an hour, the top of the shelter was taken. With the failure of the counterattack, the Japanese began to evacuate the bombproof, running out both the east and south entrances. Those running out the east entrance were literally mowed down by machine gun and rifle fire, and hand grenades. The Japanese who attempted to escape from the south entrance ran right into Marine machine-gun fire and the 37-mm. cannister from the Regimental Weapons Company guns. As the attack progressed, Companies E and G moved around the north end of the bombproof and Company K moved up on the right, stopping long enough to send engineers over to blast the south entrance of the bombproof. Then Company K advanced to make contact with Company E east of the shelter. For the time being, riflemen were left to guard the entrances to the bombproof, and shortly afterward a bulldozer was dispatched to push dirt and sand into the entrances until they were completely covered, sealing the doom of any Japanese remaining within the shelter. The forward impetus of the attack of the 2d Battalion, 8th Marines, carried the companies through the buildings and over the dug-outs until a point was reached, at the east end of the airfield, where there was danger of running into the fire coming across the front at an angle from the men of the 1st Battalion, 6th Marines, over on the south coast. The front lines were then withdrawn about 150 yards. In the area recently overrun Japanese buildings were burned and blasted and the dug-outs were cleaned out. Crowe estimated later that nearly 100 of the enemy committed suicide in this area when it was overrun. Companies I and L, over on the east end of the triangle formed by the airfield, remained in position there for the night, although the advance of the 1st Battalion, 6th Marines, had carried past that point. At dusk, Company C of Jones' battalion came up to take over the front-line positions on the north shore at the east end of the airfield, and Company K was withdrawn to build a secondary defensive line slightly to the rear. HIT BY ENEMY FIRE. This tank was put out of action on the beach. CONCRETE TETRAHEDRONS and barbed wire off the west end of Betio. 6th Marines can be seen wading toward shore in distance. two companies. The landing team remained in the position until late in the afternoon. At 1700, McLeod moved east along the south coast, following the same path taken by Jones early in the morning, until he reached a position about 600 yards to the rear of the 1st Battalion, 6th Marines. There he was ordered to remain in close support of Jones. In the morning of the third day, the commanding general of the 2d Marine Division, Maj. Gen. Julian C. Smith, decided to go ashore and operate from a command post there. With General Smith was Brig. Gen. J.L. Underhill, an observer from V Amphibious Corps, and Brig. Gen. Thomas E. Bourke. Also accompanying the general was a party of 10 officers and men from the division command post group. General Smith and his party went from the USS Maryland to GREEN Beach, arriving on the beach at 1555. After inspecting units in the beach area, General Smith decided that he could best operate ashore from a command post on Beach RED 2 and, by so doing, would not need to set up a complete command post ashore, since the facilities of Colonel Shoup's command post were already available. The best route to Beach RED 2, from the general's position on GREEN Beach, was by water via amphibian tractor. The Japanese defenders of the strong point, still holding out on the boundary between RED 1 and RED 2, fired on General Smith's tractor as it moved around toward RED 2, wounding the driver, disabling the tractor, and forcing the general and his party to transfer to another tractor to complete the trip. At 1355 General Smith arrived at Colonel Shoup's command post and joined Shoup and Edson, who briefed him on the progress of the battle at that time. While General Smith was en route to Beach GREEN, Colonel Edson called a meeting of unit commanders at Shoup's command post to issue the attack orders for the afternoon. Present were Colonel Shoup, Col. Elmer E. Hall, Maj. W.K. Jones, Lt. Col. P.M. Rixey of the 1st Battalion, 10th Marines, and Maj. C.W. McCoy, commanding the 2d Tank Battalion. McCoy had succeeded to command when the battalion commander, Lt. Col. A.B. Swenceski, was wounded in the morning of the first day of acton on Betio. Major Jones crossed the island from the south coast, where his battalion was attacking to the east, to attend this conference. and attack to the east at 1330. The initial objective assigned Jones was the tank trap at the eastern edge of the air strip. Colonel Hall was directed to attack with his combat team, less Hays' battalion, to the east from the present position of the 2d Battalion, 8th Marines. 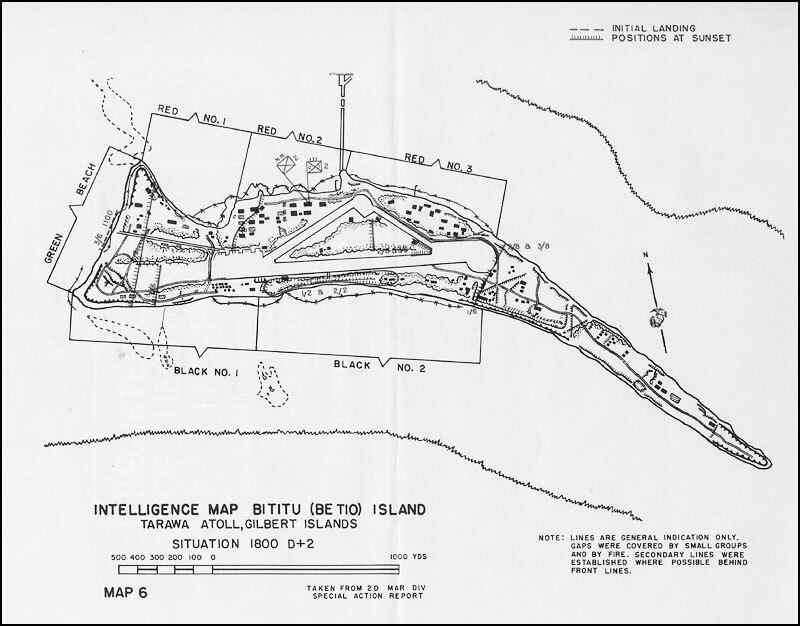 Hall was instructed to try to capture the ground north of the east taxiway in the vicinity of the Burns-Philp pier; if this could not be done, the area was to be encircled from his right and contained. The 8th Marines was to maintain contact on the right with the 1st Battalion, 6th Marines. The 2d Marines, with the 1st Battalion, 8th Marines, attached, was ordered to attack and destroy the Japanese pocket of resistance which still held out on the boundary between RED 1 and RED 2. Rixey was directed to place his artillery battalion in direct support of Jones. Edson would arrange for naval gunfire and air support prior to the attack. This bombardment would cease at 1330. When Maj. W.K. Jones received word to report to Colonel Shoup's command post for attack orders for the afternoon of the third day, he left his landing team in charge of one of his officers, Maj. F.X. Beamer. The 1st Battalion, 6th, was now in contact with Kyle's battalion on the south side of the island. Reorganizing the battalion in Jones' absence, Beamer moved Company A through Company C. The advance of the morning, roughly 800 yards, had been made against heavy opposition. The men were tired and hot and their supply of water was virtually nonexistent. There had been several cases of heat prostration during the morning and Beamer made every effort to obtain water for the men before the afternoon's attack began. Since there was no readily available supply of water, only a small portion of the assault company was able to replenish its water supply before moving out. At 1230 Company A, with one medium tank and seven light tanks attached, began to pass through LT 1/2 in order to be in position to attack in compliance with Colonel Edson's orders at 1330. Seventy-five yards behind Company A was Company B in close support; in reserve and following B was Company C, the company that had led the attack through the morning. Immediately Company A attacked to the east from the positions of the 1st and 2d Battalions, 2d Marines, it came under fire from strongly organized Japanese weapons. Part of the fire came from weapons mounted in a turret-type emplacement near the beach. The light tanks were unable to destroy the emplacement with their 37-mm. guns and it was necessary to call up the medium tank before the position was finally neutralized. This one position held up the attack for nearly an hour and a half. At 1500 water was brought up and distributed to the entire battalion. Company B was issued water and salt tablets and at 1600 moved up to pass through Company A to continue the attack. At 1530 Jones received an order from division directing that one company be sent over to relieve the 2d Battalion, 8th Marines, in the sector north of the air strip. Jones selected Company C for this mission and, at 1600, after issuing water and salt, the company moved over to relieve the 2d Battalion, 8th Marines, about 300 yards east of the Burns-Philp pier on the north side of the island. In the meantime, Company B passed through Company A and attacked toward the tank trap at the east end of the air strip; Company A followed about 75 yards behind the rear troops of Company B. Bitter enemy resistance slowed the attack to a halt at about 1830, and the landing team commenced to dig in for the night. Company A moved up on the left of B until it was abreast and in visual contact with Company C on the other side of the round turntable at the east end of the air strip. While his two companies on the south side of the island reorganized and consolidated their positions for the night, Jones ordered an outpost line forward about 50 yards ahead of his main line of defense. This line was withdrawn later. At dark the TBY radio of Company C failed to function and the battalion lost contact with that company. The open ground between C and A was covered by machine guns. Now Jones turned to amphibian tractors to evacuate his wounded. Over 200 of the enemy were estimated killed during the afternoon attack. 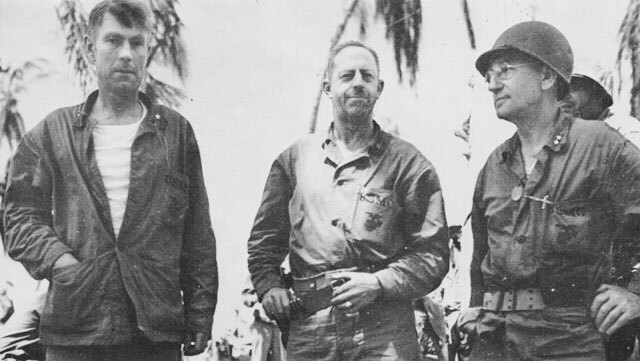 MAJ. GEN. JULIAN C. SMITH, commanding general of the 2d Marine Division (on the right); Col. Merritt A Edson, chief of staff (center); and Brig. Gen. Thomas E. Bourke, commanding general of the 10th Marines, after the battle. against the enemy stronghold on the RED 1-RED 2 boundary line. At sundown of this day, the third day of the action, the enemy, with the exception of the group in front of the 1st Battalion, 8th Marines, was compressed into the long tail of Betio east of the air strip. If the Japanese ever intended to launch a counterattack, this was the night to do it. Each night the Marines had dug in with the uneasy feeling that before morning the Japanese would stage a "banzai." So far, the mad, suicidal, headlong rush had not come. Jones made every preparation to repel such an attack when his companies organized their positions at dusk on 22 November. Situation not favorable for rapid clean-up of Betio. Heavy casualties among officers make leadership problem difficult. Still strong organized resistance areas 212, 213, 214, 237, 210, 209, 208. (These target areas were all in the vicinity of the east end of the airfield.) Many emplacements intact on eastern end of the island. Present front line approximately on the western edge of 214, 236, and 212. In addition, many Japanese strong points to westward of our front lines within our position that have not been reduced. Progress slow and extremely costly. Complete occupation will take at least 5 days more. Naval and air bombardment a great help but does not take out emplacements. What General Smith did not know, or anyone else except the Japanese for that matter, was that the events about to transpire during the night, the third night ashore, would cast a different light on the situation and create more optimism next morning than had been felt thus far through the whole battle. PRISONERS HUDDLE ON END OF PIER as shore party personnel manhandle supplies of water. 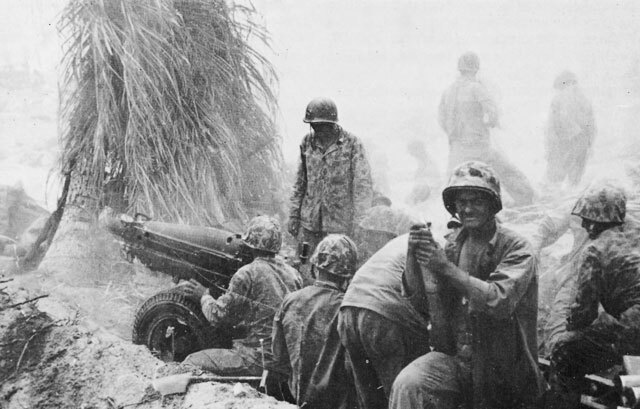 The 1st Battalion, 6th Marines, was receiving a Japanese counterattack. Rixey's artillery was delivering fire into the area where the Japanese were forming up their counterattack. McLeod had been ordered to move up behind Jones to support the latter. The 2d Battalion, 6th Marines, was to be relieved of its assignment over on Bairiki and was to move over to Betio and land on GREEN Beach. Holmes then received orders to continue the attack to the east on the following morning, passing the 3d Battalion, 6th Marines, through the 1st Battalion in order to put fresh troops into the assault. All available tanks were to support the attack of the 3d Battalion. 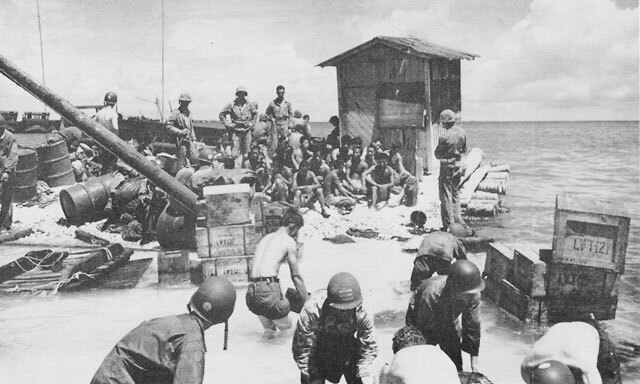 The 2d Battalion, 6th Marines, when ashore on Betio, would follow the assault of the 3d Battalion, prepared to support the attack. Before leaving the conference, Holmes made arrangements for artillery, naval gunfire, and air support for the attack. While the conference was going on, the 1st Battalion, 6th Marines, was busy repelling a counterattack which began at about 1930. The attacking force of Japanese was small, being about 50 men. Infiltrating through the outpost line, the enemy opened a small gap between Companies A and B. Jones had all three of his rifle companies committed and his reserve consisted of his 81-mm. mortar platoon and a handful of men from Headquarters Company and Weapons Company. Jones instructed the executive officer of his weapons' company to take the battalion reserve to clean up any Japanese who had infiltrated, close the gap between Companies A and B, and assist the commander of Company A in reorganizing and further consolidating the front lines. The mission was accomplished by 2030. Then Jones asked Maj. W.B. Kyle, of the 1st Battalion, 2d Marines, to place a company about 100 yards to the rear of the front lines in order to establish a secondary line. Apparently the Japanese made this small show of attacking as a preliminary to a main attack in force. There are three good reasons why the main attack did not follow in quick succession: (1) The excellent artillery fire support of the 1st Battalion, 10th Marines, reinforced by the fires of the 2d Battalion, 10th Marines, firing from positions on Bairiki; (2) the successful elimination of the enemy from the front lines; and (3) the limited use of Marine automatic weapons. During this initial "feeling out" attack, Jones called for artillery fire to fall within 75 yards of the front lines. He hoped that the bulk of the artillery fire would land in the midst of the counterattacking force. Actually, this was not the case, but the artillery fire served to form a screen which prevented the main body of Japanese from following up its initial infiltration. In repelling this first counterattack, the men of Companies A and B held the fire from their automatic weapons to a minimum, and the fighting consisted mainly of close-in fighting, bayonet work, and the prolific use of hand grenades. During the 2 hours which followed this attack, the Japanese who had infiltrated into the lines and had caused a gap between the two companies were mopped up by the battalion reserve and this work also consisted of close-in fighting and bayonet engagements. As a result, the enemy was unable to discover the exact location of the front lines or the positions of the automatic weapons. Perhaps it was the failure of their first attack to gain information which caused the enemy to attempt another counterattack at 2300. Again, about 50 of the enemy attempted to create a diversion in the sector of Company A by firing small arms, throwing grenades, calling out, and moving around. At the same time, another 50 Japanese attacked Company B. Using machine guns, 60-mm. mortars, and grenades, Company B had little difficulty repulsing the attack. This time it appeared that the Japanese were trying to secure the information about the Marine positions and strength that the first attack had failed to obtain. PACK HOWITZER FIRING in support of advancing troops. These guns played an important part in stopping the Japanese counterattack during the last night of the battle for Betio. Between the first and second attacks, Company I of the 3d Battalion, 6th Marines, moved up to replace the troops of the 1st Battalion, 2d Marines, in the secondary line, 75 yards to the rear of the front lines. A medium tank brought up water, small-arms ammunition, and grenades to a dump 50 yards behind Company A. From about 500 yards east of his lines to the extreme eastern tip of the island, Jones requested that naval gunfire be placed. This was designed to disrupt enemy communications, disorganize any group bent on reinforcing the attacking forces, and to keep the enemy down within his emplacements. In the area between the zone assigned to naval gunfire and his own front lines, Jones called for, and received, continuous harassing artillery fire. The attack at 2300 on the right side of the line evidently served its purpose, for it was in this sector that the Japanese launched their heaviest, and final, attack at 0400, 23 November. About 1 hour before the final counterattack, the enemy began to fire heavy and light machine guns into the Marine lines from positions set up in some wrecked trucks about 50 yards in front of the lines. Some of the enemy guns were destroyed by fire from Marine heavy machine guns; three enemy guns were destroyed by Marine noncommissioned officers who voluntarily crawled out in front of the lines to use hand grenades on them. The enemy was to attack one more time. At 0400, about 300 Japanese moved forward to hit all of Company B's front and the right front of Company A. At the same time, several of the enemy made noises to divert the attention of the men on the left (north) side of Company A's line. Lt. N.E. Milner, 1st Battalion, 10th Marines, forward observer in a front-line observation post with the 1st Battalion, 6th Marines, called his artillery fire to within 75 yards of the front lines. By 0500, 23 November, the counterattacking Japanese were repelled. In the front lines of the two companies, and along their front to a distance of 560 yards, lay the bodies of more than 200 enemy dead. Out beyond that were the patterns made by the artillery concentrations; this are was littered with the broken and battered bodies of approximately 125 Japanese, destroyed by the artillery. Firing out beyond the artillery patterns and helping to keep the enemy from moving freely, the USS Schroeder, and later the USS Sigsbee, did excellent work. 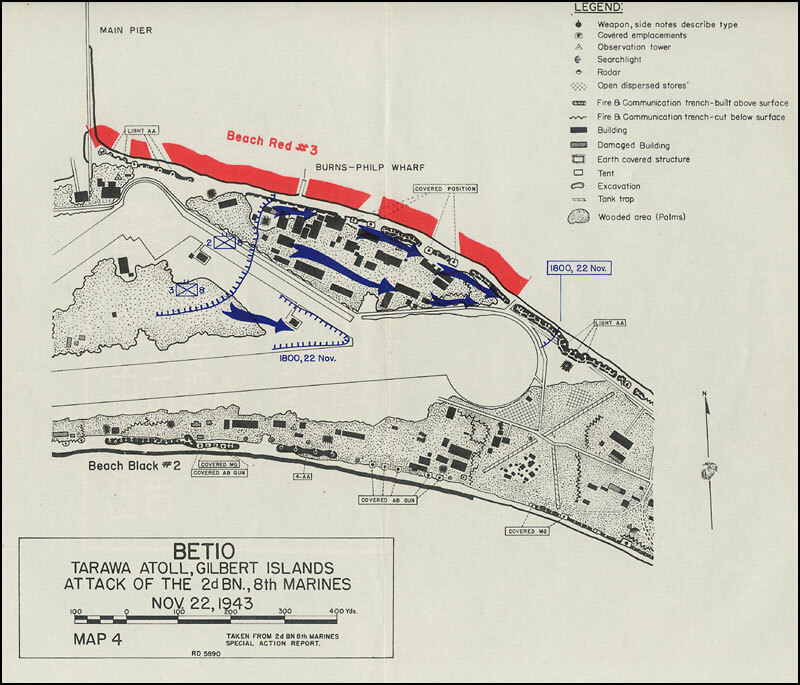 During the first night that Marines were ashore on Betio, the night of 20-21 November, it is reported that there was an air attack; that it had little more than nuisance value. HALF-SUBMERGED BULLDOZER starts in toward Beach RED 2. WADING ASHORE ON GREEN BEACH, these men of the 3d Battalion, 6th Marines, met no enemy fire in the morning of the third day of battle. 1830, French requested permission to be taken back aboard the ship. Permission was refused since at that time the fleet was expecting an air attack. French and Cook then flew north for a few miles and then returned toward the fleet at about 300 feet altitude. According to Colonel Cook, the fleet, apparently thinking the approach of this plane was the beginning of the air attack, opened fire. Fortunately, the gunnery was a bit off, and French landed his plane as quickly as possible, feeling that the water was safer than the air at that time. After floating all night, French brought the plane back to the Maryland next morning. Just before dawn on the morning of the second day, the USS Maryland reported unidentified aircraft approaching. Admiral Harry Hill directed his northern picket ships to fire at random, acting as decoys. The enemy planes paid little attention to the firing of the picket ships and came on in to drop at least three sticks of bombs on the island, causing fires to blaze up momentarily, but resulting in practically no damage to the troops ashore. The planes, estimated to be eight, did not press home the attack and left the area at once. Again on the morning of the third day, at 0340, unidentified aircraft were reported coming in from the northwest. Four enemy planes arrived to bomb the island, but did not molest the ships. These enemy air attacks were anticipated, although every effort had been made to neutralize all airfields on closely adjacent island groups. Admiral Hill received intelligence reports on 21 November, early in the day, that the Japanese might attempt to stage large air attacks through Milli or Taroa. In addition, it was reported that the enemy was massing submarine strength in the area of Tarawa and that the expected time of arrival of the submarines would probably be on 23 November. At noon on 22 November, the USS Gansevoort reported a submarine contact to the west of the transport area. An investigation of the contact failed to obtain further results. Less than an hour later the USS Meade reported a submarine contact in the same area. Still the enemy craft could not be definitely located, and the destroyers continued to cruise around in the area, hoping to destroy the Japanese submarine. Again at 1530, and later at 1627, contacts were made and the USS Frazier went out to join the other two destroyers in their grim game. After several depth charges were dropped, the enemy submarine was forced to surface. The periscope broke water between the Meade and the Frazier and as the hull appeared, the two destroyers opened fire, the Frazier then moved directly toward the enemy craft and rammed it. Three prisoners were rescued from the submarine, which was identified as the RC-35 [sic: I-35]. The Frazier received damage to her bow as a result of the ramming and was forced to reduce her speed in order to prevent taking in too much water.